Recently, Social Justice Tours ran a piece about slavery in New York, focusing on the ways New York capitalized off of the plantation economy. But New York was also a hotbed of abolitionist activity, a place where commerce, geography and politics collided and produced some of the staunchest anti-slavery activists in the country. Nowhere was this more true than in Brooklyn, a bastion of slave-based agriculture that slowly became an epicenter in the struggle for emancipation. At the turn of the 18th century, Brooklyn seemed like one of the last places an abolitionist movement could grow and thrive. As a port city, New York depended on the slave economy for the foodstuffs and raw materials that it exported to other countries. But the area now known as Brooklyn—at the time a sleepy collection of small agrarian villages—relied on small-scale slavery to produce and harvest its food. In the 1700s, 45 percent of Manhattan households owned slaves, compared to a full 60 percent in Brooklyn. By 1820, 95 percent of blacks in New York City were free, but in Brooklyn, only 50 percent had been granted independence. Even when New York state abolished slavery in 1827, both Manhattan and Brooklyn were still overrun with both slaveholders, who traveled with their “servants” when visiting the city, and slave catchers, who preyed on the black population and regularly kidnapped free blacks and forced them into slavery. In response, people across the country mobilized against slavery, and William Lloyd Garrison, a white abolitionist and newspaper editor, founded the Anti-Slavery Society in 1833, along with Arthur Tappan, a prominent white New York merchant and anti-slavery advocate. Tensions between pro- and anti-slavery forces boiled over just six months later, as mobs opposed to abolition rioted and ransacked the homes of many Manhattan abolitionists—Tappan included. As New York’s economy plummeted into deep recession, Tappan and many other abolitionists absconded to Brooklyn, where land prices were suddenly cheap and pro-slavery forces weren’t as organized. But they were not the first to do so. For years, black abolitionists had been moving to Brooklyn and building up their own anti-slavery movement, agitating for everything from emancipation and full civil rights to the health and welfare of their friends and families. As they did so, they formed thriving black communities in what is now Williamsburg and Crown Heights, banding together to ensure the right to vote, to make a living, and to gain an education. After New York’s Constitution 1821 mandated outrageous property requirements before blacks could qualify to vote, black leaders came together to build an intentional community that pooled land. (The effect of the mandate was devastating: Under the new rules, only 16 blacks in all of New York County qualified to vote.) 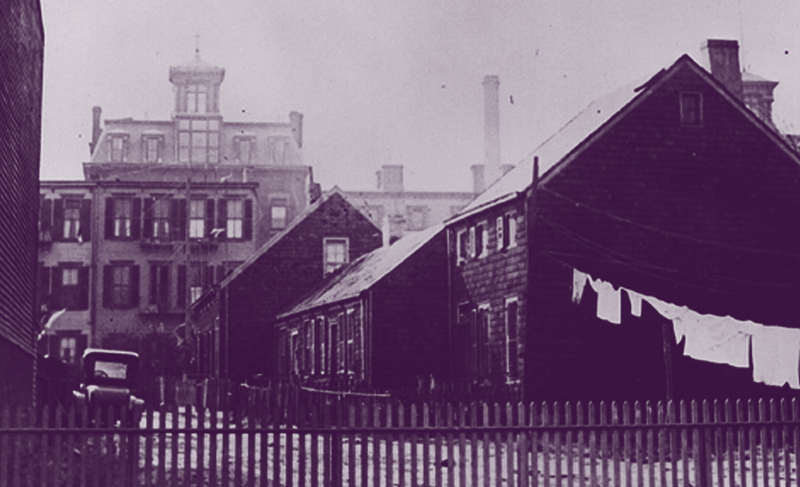 Named for black longshoreman James Weeks, one of the original investors in the community, Weeksville (now in Crown Heights) was home to over 500 free blacks by the 1850s, boasted high rates of black homeownership, and was home to its own churches, schools—including the first to integrate its staff and students—an old age home, and one of the first African-American owned newspapers in the country. Meanwhile, in Williamsburg, black activists were busy creating another hub of anti-slavery activity. Drawn to Williamsburg because of its healthful, rural character, William and Willis Hodges moved to the Bedford area in 1830 and quickly became leaders in the abolitionist movement. Noting that they were the only black members of the Brooklyn Anti-Slavery Society, the Willis brothers went on to create organizations run explicitly by and for black people, from the Williamsburg Temperance Benevolent Society—founded in 1841—to the New York Society for the Promotion of Education Among Colored Children (1847). They also started their own abolitionist newspaper, The Ram’s Horn, which featured articles by the likes of Frederick Douglass and John Brown. When 40 black schoolchildren were denied entrances into Brooklyn public schools, the Hodges and several other black activists formed Williamsburg’s African School, which educated a generation of new black thinkers and activists including Sarah Smith Garnet, who went on to serve as Brooklyn’s first black principal and to found the Equal Suffrage Society—the first anti-slavery organization founded for and by black women. Although white abolitionists failed to regularly interact or collaborate with black anti-slavery activists, Brooklyn was still a major and often radical force in the emancipation movement nationwide. Eventually, of course, these abolitionists forced the government’s hand, and some lived to see the full emancipation of black people from the bonds of slavery. But as the subsequent history of Williamsburg clearly shows, the second prong of the abolitionist movement—to bring full civil rights and opportunities to black folks (and by extension, people of color—is still being played out, as the battles over land and housing reveal deeper race-based schisms in American society.